Mid to late summer. Long bloom period. Easy. Division rarely needed. Beautiful color and long blooming. Keep soil on lean side to avoid floppy growth. This flowering plant is very different from the common shrub which is a close relative. 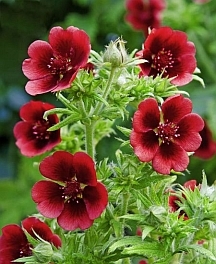 The herbaceous potentillas are also known as Cinquefoils. They grow best in well-drained, sandy or loamy soil in full sun or very light shade. Plants are about 2 feet tall. The variety I sell is "Monarch's Velvet," named for its deep red, black-centered blossoms. The bloom period lasts much of the summer. New plants should be spaced 12 to 18 inches apart. Division is usually not necessary but can be performed in the spring as a means of increase.